Dominion - Three game nights this week, all three nights we only played one game. No filler to start or end, every minute spent working our way through the various Dominion recommended set ups while trying to efficiently master our decks. I think I've said it before but it doesn't hurt to say it again - Dominion is a Must Buy purchase! It's so easy to play, in fact the rule book explains the rules as 'ABC' and they literally are that easy. Learning how the different cards works is also pretty simple to pick up, but mastering the balance of your deck? An entirely different story! You need victory points to win, but having too many too early can really cripple your hand. You need to be diverse, focus on cards that will give you more cards/money/actions/buys etc and build up your deck engine faster and more efficient than your opponents and load up on those victory points once its running. Dominion is a breath of fresh air for me as I had never played a deck builder before this, and now that I've played one I can't get enough. By the way, we still haven't included any of the Intrigue cards. It's rare for me to buy new board games and not even attempt to play them. As mentioned however, Dominion has been the focus at the moment so these filler games will have to wait! Also I've decided to split this into two posts as I don't anticipate buying any new games again for a little..
Dream Home - This game oozes with charm and seems like it'll be a perfect game on the easier side of things for those friends who don't really get into board gaming the way I do. Bright, colourful and attractive artwork to match a theme of house decorating (or designing really), make for a good combination to hopefully lure and appeal to some friends who still think board games are about Monopoly or Pictionary. Been wanting Dream Home for a while so am pleased to finally have it! Cardline : Globetrotter - I've enjoyed my short time with the Timeline series enough to try and diversify it a little as to not get old so quick. After purchasing this on a whim, I've since discovered the two games are not really mixable. Guess I should have known since the titles are different. At least there's a couple ways to play Cardline, am I'm fairly confident we'll try the population and maybe the land mass variants at some point. Thief's Market - I actually don't know a whole lot about this one, it was a Kickstarted game and something about the theme appeals to me. 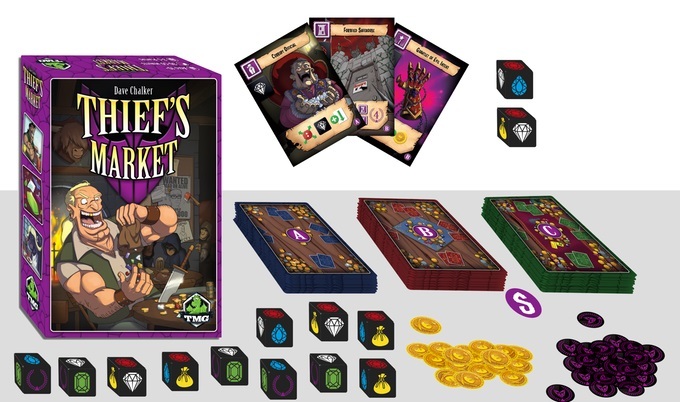 Most of this next batch of games were impulse buys to capitalize on a good sale, and I had seen Thief's Market on Instagram a couple of times so am hoping it was worth the purchase. I'm thinking its a fast paced, bluffing / take that game.. but I could be completely off on that. I guess a big reason I didn't try any of my new games this week is purely for this reason. Aside from Dream Home, none of the rest were planned purchases for the library. There could be a few duds but I'm hoping I might discover a treasure or two as well and I've got my hopes up for this one as being in the latter category.